Does it seem like everyone has an opinion about your wedding plans? Flip through magazines, have tea with your grandmother, scroll through Pinterest…and you begin to doubt every decision you make. Read on to discover 10 wedding planning myths. Guess what? 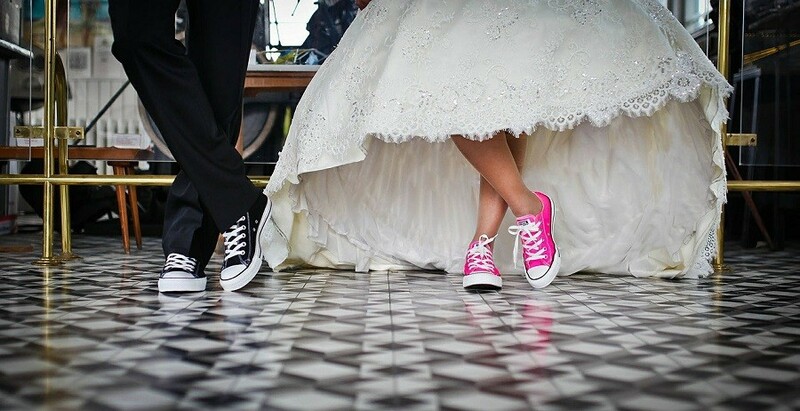 Your wedding day is about what you want. It should reflect your personal style, and represent to your family and guests who you and your partner truly are. If you haven’t heard these mythical “musts”, get ready; sooner or later, your eyes are going to roll. Even if your parents are footing the bill, they’re not the ones getting married. You can head them off by engaging them in conversation about their favourite (and least favourite) wedding day moments, but it’s okay to make it clear that you have the final word. Billy Idol songs aside, you can break tradition when choosing your wedding dress. Don’t worry about everyone whispering about your chastity; if the shoe were on the other foot and you were wearing virginal white, nobody would raise an eyebrow—even if you and your intended have been “living in sin” for the past decade. Pick a colour…any colour! Why forego a wedding band when you can have a friend plug in a laptop or their iPod? Even if you had all the right monitors, cables, and miscellaneous equipment you need to keep your entire party hopping, glitches do happen. Professional wedding entertainers have the best equipment, and they’re attuned to the inevitable ups and downs of every wedding. Will you be able to quickly pause your playlist or switch to a more appropriate song if your auntie spontaneously makes a heart-rendering speech? Or will you just let Baby’s Got Back play out? “You’re invited to my wedding! On one condition…” Even when friends are happy to help, engaging a buddy to do a professional’s job could cause friction down the road. Just because someone is known to throw great weekend dinner parties doesn’t make them able to coordinate wedding singers, caterers, photographers, and florists. And if things go pear-shaped, what then? As long as you’re not triggering grand mal seizures with wildly clashing tones, you can incorporate all your favourite hues into your wedding design. Give your bridesmaids their pick from a selection of colours, and use multi-coloured wild flowers in your floral arrangements. You’re getting married, not hosting a wake. Asking your guests to bring food to your wedding can be perceived as an insult, especially to those who have purchased expensive gifts, or who travelled thousands of miles to attend your day. You might as well ask them to hit the tin. Scrimping on meals on your wedding day is never a good idea when alcohol is available, and you’ll want to be sure to accommodate your special-diet guests. Only a year ago, throwaway cameras were the trendy money-saver…that is, until wedding couples discovered that cameras would go missing, or “junk shots” weren’t a term reserved for poor composition. Get a room full of old college rugby mates together, add alcohol and smartphones, and you likely won’t get the “do-it-yourself” wedding album of your dreams. Once you factor in wedding tents, portable dunnies, lighting, rental furniture, and outdoor dance floors, you might find that you’d wished for a more inclusive venue. If you don’t have some sort of shelter capable of protecting your entire party, that’s the day when a cyclone will hit. If you’re going to have an outdoor wedding, be sure to have contingency plans in place for bad weather, and make sure mobility-challenged guests can safely get around. You might need to help out a few close friends or ask your willing parents to assist with travel expenses for some cherished relatives, but if your wedding promises a warm welcome and thoughtfully-planned events on the days before and after your wedding day, you’re bound to have a full house. Be sure to include in your invitations (or on your website) hotel information suited to every budget. Do you want your day to be about you and your intended, rather than what some bridal magazine demands? Lily Road works with the best wedding musicians and wedding singers in the Melbourne and Sydney areas, and you’re sure to find the entertainers who best match your musical style. Contact us for more information. While you’re at it, ditch that MP3 player.